"Every year when it's time to go back to school I get inundated with requests from students to post recipes that are super-easy, cost pennies, and require a bare minimum of kitchen equipment. 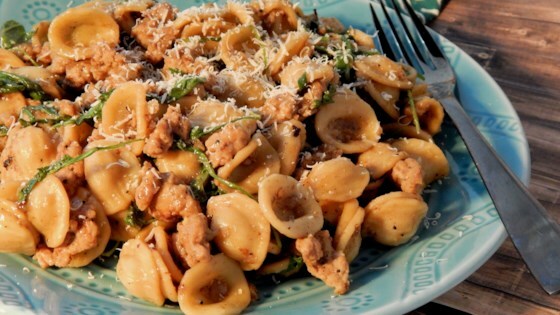 This delicious orecchiette pasta recipe only has a handful of ingredients, is very cheap to make, and most importantly: only uses one pan or pot for the entire procedure." See how to make a quick Italian pasta with Italian sausage and arugula. Have made this many times with amazing results. My wife and I consider ourselves foodies and this can be made and presented with amazing results. Great job Chef John! Great easy recipe!!! My husband loved it.... i used baby spinach instead & added a red pepper & mushrooms to it, next time I think I will add some pinenuts as well.